The new facility will enable testing of wastewater pumps up to 20 000 pounds (lbs) in horizontal and vertical configurations, providing customers with in-depth and exact performance data for their intended application. 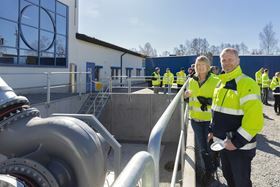 Pictured are Marie-Louise Lennartsson, Order Specialist at Great & Grey, with Benny Moline, Production Engineer at Xylem Emmaboda, at the new dry test pit for large capacity pumps at Xylem’s global manufacturing plant in Emmaboda, Sweden. 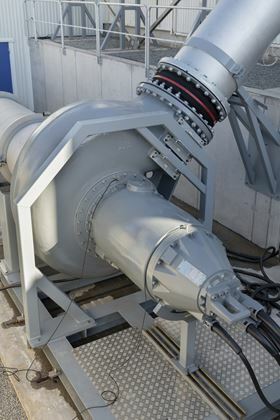 Xylem has inaugurated a new dry test pit for large capacity pumps at its manufacturing plant in Emmaboda, Sweden. The new facility will enable testing of wastewater pumps up to 20 000 lbs in horizontal and vertical configurations, in a dry environment on-site at Emmaboda. A first for Xylem in Europe, the dry testing pit will reduce the delivery times of pumps requiring witness-testing in a dry installation. Until now, the pump would need to be sent either to Xylem’s custom pump testing facility in the US or to a third-party testing location. Customers can now attend the testing on-site at Xylem’s facility in Emmaboda, benefiting from not only the testing itself, but receiving expert advice and visiting other parts of the factory to view the entire manufacturing process. Nassau County in New York is the first customer to avail of the new testing facility following an order for four Flygt CZ3800 dry horizontal installed wastewater pumps. The pumps will be used to help increase the municipality’s stormwater management capacity. Nassau County representatives attended Emmaboda for on-site pump testing and a ceremony to mark the inauguration of the test pit.